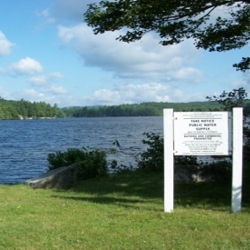 Hillsborough, NH’s public water system has regularly exceeded standards for chlorinated disinfection byproducts – both total trihalomethanes and haloacetic acids. In 2011, we were retained to investigate two proposed changes to their chlorine-based treatment system: post-filtration with granular activated carbon; and UV disinfection followed by chloramination. Bench and pilot-scale testing results favored the UV / chloramine approach. The Town procured the UV equipment directly and awarded a separate installation contract. In June 2014, the UV and chloramine systems were completed and placed on-line. Quarterly sampling taken about 3 weeks later resulted in a 90% TTHM reduction from about 140 to 12 µg/L. Similarly, HAA5 was reduced about 75% from 66 to 17 µg/L. The project was under budget at about $820,000 including equipment, installation and engineering for the 1-mgd system and was financed under the NHDES SRF program.